Home » Ginseng, Chinese White root powder 1 oz. 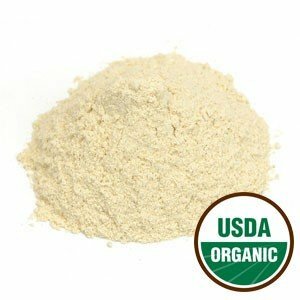 Ginseng, Chinese White root powder 1 oz. The common name ginseng derives from the Mandarin name for the plant, ren shen, which translates roughly as "essence of the earth in the form of a man," a reference to the humanlike shape of some ginseng roots. The genus name Panax derives from the Greek panakes, "panacea," and seng, the term for a fleshy root that is used as a tonic. Ginseng is a perennial that grows in shady hardwood forests of North America (P. quinquefolius) and temperate regions of Asia (P. ginseng). The stalk reaches a height of 1 to 2 feet. The leaves are palmate and divided into three to seven (usually five) sharply toothed leaflets. The hermaphroditic flowers are white to yellowish and grow in round umbels. Red berries follow the flowers. Ginseng is not a quick cash crop, as the roots must be five to seven years old before they become ready for harvesting. Asian ginseng has an incredibly long history of use in Chinese medicine, dating back some six thousand years. It is valued especially for its restorative and energizing properties. In the 1700s French missionaries discovered that a plant growing near the Great Lakes and being used by native peoples in love potions and as a tonic was a New World relative of the Asian species. Due to overharvesting of wild ginseng in China, there was a ripe market for this American commodity, which of course led to the overharvesting on this continent as well. Even Daniel Boone was a ginseng harvester. American ginseng has properties similar to those of Asian gingeng, but it is considered to be milder, and it is more likely to be prescribed for younger people. Ginseng, of either variety, helps the body better utilize oxygen, spares glycogen utilization, increases cerebral circulation, helps the adrenal glands to better conserve their stores of vitamin C, aids in stabilizing blood sugar levels, helps balance hormone levels in men and women, reduces LDL ("bad" cholesterol) levels while elevating HDL ("good" cholesterol) levels, and aids in the production of DNA, RNA, interferon, and red and white blood cells. It can improve stamina, reaction time, and concentration, which make it useful for such pursuits as studying, taking tests, long-distance driving, and meditating. It also speeds recovery time from sickness, surgery, childbirth, athletic performance, and other stressors to the body. Ginseng is used in the treatment of adrenal deficiency, AIDS, Alzheimer's disease, anemia, appetite loss, atherosclerosis, chemotherapy side effects, chronic fatigue, depression, diabetes, diarrhea (chronic), drug addiction and withdrawal symptoms, erectile dysfunction, fatigue, heart palpitations, infertility (male and female), insomnia, low libido, low sperm count, malabsorption, memory loss, menopause symptoms, night sweats, organ prolapse, post-traumatic stress (physical and emotional), radiation exposure, shortness of breath, stress, stroke, and tuberculosis. American ginseng is white; the root is simply harvested and cleaned. Asian ginseng, on the other hand, is often steamed with herbs and wine, which gives it a reddish color and a more warming quality. Thus American ginseng is more often used during the warmer times of the year, while Asian ginseng is best used during cooler seasons. Ginseng's effects are cumulative, and most benefit occurs after a period of use, although some users will notice immediate effects. Many athletes use it for a week prior to a competition. Although the root is the primary medicinal component of the plant, the leaves of both varieties can be used to treat hangover and fever. For best effect, take ginseng between meals rather than with food. It is best not to take ginseng at night as it could impair sleep. The root is edible when soaked or cooked if dried; it is commonly added to soups and grain dishes. The root also makes a delicious and therapeutic candy. It also can be infused in liqueur or wine. Ginseng is often included in anti-wrinkle facial products as it helps heal and soften the skin. Avoid ginseng in cases of heat and inflammation, such as fever, flu, pneumonia, hypertension, or constipation. Do not give to children for prolonged periods, as it may cause early sexual maturation. Avoid during pregnancy and while nursing. Do not take ginseng in conjunction with cardiac glycosides except under the guidance of a qualified health-care professional. The neck of ginseng root is mildly emetic and should not be used as a tonic.